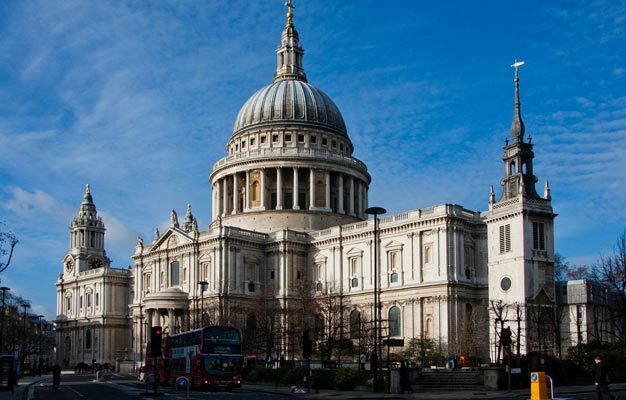 Book your entrance tickets to St. Paul’s Cathedral before you leave home, and skip the line to the box office! St. Paul´s Cathedral is the second cathedral built on this location, as the first burned down to the ground in the great fire of London in 1666. St. Paul´s Cathedral is the biggest church in Northern Europe, and is built in the shape of a giant cross with the famous dome situated in the middle. -	Multimedia Guide: 2010 saw the launch of a multimedia guide, which is included in the admission price for all individual visitors and is available in English, British Sign Language, French, German, Italian, Spanish, Portuguese, Polish, Russian, Mandarin, Japanese, and Korean. The guide uses film, new photography as well as a detailed commentary to offer an effective interpretation of this unique landmark. -	Scheduled guided tours: Tours of the cathedral floor and crypt led by cathedral guides run four times daily at 10:00, 11:00, 1:00, and 2:00. Individual visitors can join these on arrival at no extra cost and they last 90 minutes (spaces are limited). -	Oculus: An eye into St Paul’s uses state-of-the-art projection technology to immerse visitors in the fascinating stories and history of this iconic landmark. The first project of its kind in a cathedral, Oculus is an award winning 270° film experience that brings 1400 years of history to life. Ticket Selection Choose the date you arrive in London as “Valid From” date, as the tickets you buy here is valid for 1 month from the “Valid from” date you select. Choose number of tickets and click on “SEARCH”. Then select “Adult” or Child” tickets (Child tickets are available for children aged 6-17 years). Child tickets can only be purchased when buying adult tickets. Children younger than 5 years are free as long as they are accompanied by an adult. Mon - Sat. 8:30AM - 4:30PM, last admission 4:00PM. Galleries open at 9:30AM, last admission to the galleries is at 4:15PM. Sunday is closed for visitors and tourists.